Mini Portable Folding Stool - Indoor and Outdoor Essential - Convenient and Practical - A good helper in life. Mini portable folding stool is simple and convenient, it could be folded and unfolded within seconds easily. ★【LIGHTWEIGHT AND EASY TO CARRY】Mini portable folding stool is very light, it weighs 1.7LBS only. Can be folded into a small piece and ultralight bag, This special designed bag is attached for convenient carry when you go out. It saves a lot of space. Unfold size is 11.5" L x 11.5" W x 12.2 H", Fold size is 14.5" L x 4.5" W.
★【COMFORTABLE AND DURABLE】600D double Oxford fabric square seat is soft and comfortable, high strength steel pipe frame is anti-oxidation and corrosion,max loading weight up to 220 lbs/100 kgs, four legs give great support and you will never tip over with the anti-slip feet, ensures comfortable sitting experience, even if you sit on for a long time, you will not be tired. 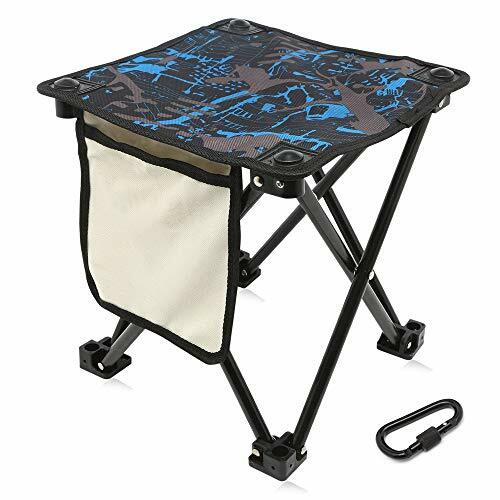 ★【SIDE POCKET AND HANGER】Portable folding stool is designed with one side pocket, you can put your mobile, bottles and other belongs in it, an extra hanger is available for you to attach to your bags, bicycles etc. ★【MULTI-FUNCTIONS】Mini portable folding stool is ideal both for indoor and outdoor activities, perfect for family party, sports meeting, picnic, camping, BBQ, fishing, hiking, garden, mountaineering, beach etc, a convenient and a good helper in life. ★【100% GUARANTEE】We are very confident with the quality of our folding stool and we are sure you will love this folding stool too. while, if you are not satisfied, please feel free to contact us for replacement or full refund at any time. If you have any questions about this product by Migree, contact us by completing and submitting the form below. If you are looking for a specif part number, please include it with your message.